The Oops Crib by Structured Green features a bold new aesthetic in baby furniture. The "Drop" detailing of the crib, comprised of variegated strips of reclaimed woods, results in a wonderfully unique and modern nursery look. Structured Green's mission is to use quality materials that are sustainably produced, certified or reclaimed, recycled or recyclable, to create their lovely furniture pieces. 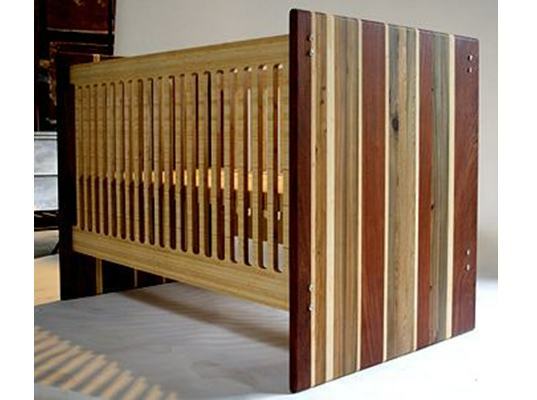 The Oops Crib fits the bill with the sturdy, child-safe sides made of bamboo, water safe adhesives, and a finish of raw, food grade tung oil. The designers give insight regarding the origin of the 'Oops' name offering, "When Mom said you were her happy accident, she was only half kidding. We love you just the same."